(Warning! This story contains mild SPOILERS and one big nasty rumor. Tread with caution!) Earlier today, we showed you new photos and the latest EW cover featuring Star Wars: The Force Awakens villain Kylo Ren, played by Adam Driver. Part of EW's Fall Movie Preview, this issue also has a full article dedicated to the bad guy, who, as it turns out, is not exactly a Sith Lord. Instead, he belongs to The Knights of Ren. Kylo Ren was officially revealed in the first Star Wars: The Force Awakens teaser trailer that debuted last December, exactly one year before the movie is set to hit theaters this year. He was introduced to audiences with his back to the camera. His most distinguishing feature was a red sparking lightsaber with a unique crossguard at the hilt. It sent fans into a tizzy. Some loved it, some hated it, while others spent hours speculating who this ominous dark figure walking through the snow really was. It wasn't until this past June that director J.J. Abrams finally revealed what many suspected. It was Adam Driver behind this stalking creature. His face and mask was fully unveiled in a Vanity Fair cover story earlier in the year. Kylo Ren is part of the New Order, a remnant of the Empire that arose in the aftermath of the Death Star's destruction in Star Wars: Episode VI - Return of the Jedi. In one of the new photos released, he is seen flanked by the New Order Stormtroopers. He is striding through the smoldering remains of a once peaceful village, and if you look closely, you will notice a burning funeral pyre in the back ground. Some are speculating Kylo Ren has just cremated the body of Han Solo after beheading him. Past rumors point to Han and Princess Leia being Kylo Ren's father and mother. None of that has been confirmed by anyone associated with the movie. EW does say that this scene takes place on the desert planet of Jakku. And they hint that we already know (and possible love) his parents. 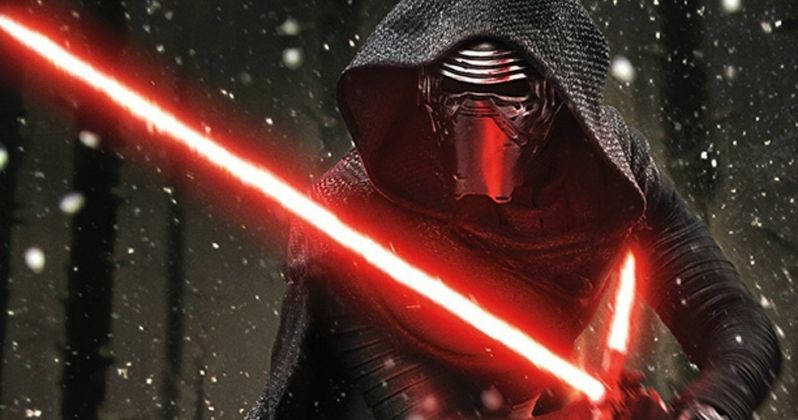 What is Kylo Ren's mission in Star Wars: The Force Awakens? We may not know the full breadth of that until the film opens this Christmas. He is obsessed with Darth Vader. And he is influenced by the Dark Lord of the Sith, who perished long before Kylo's birth. J.J. Abrams explains that fans will learn where Ren's appearance originates. He stated the following. "The movie explains the origins of the mask and where it's from, but the design was meant to be a nod to the Vader mask. [Ren] is well aware of what's come before, and that's very much a part of the story of the film. The lightsaber is something that he built himself, and is as dangerous and as fierce and as ragged as the character." As many know, Darth is not a first name but a rank and title of the Sith. The same is said for Ren, which is not a traditional surname, but something similar to the ranking of the Sith Lords. J.J. Abrams reveals a big new piece of lore will be introduced into Star Wars: The Force Awakens, and they are called the Knights of Ren. But we may have to wait until the film comes out to learn much more than that. "He is a character who came to the name Kylo Ren when he joined a group called the Knights of Ren. He is not your prototypical mustache-twirling bad guy. He is a little bit more complex than that, and it was a great joy to work with Adam Driver on this role, because he threw himself into it in a deep and remarkable way." So, who are the Knights of Ren? And why haven't we heard of them until now? That will all be revealed in the coming months, with the first Star Wars toys hitting store shelves this September possibly offering even more clues. Kylo Ren's backstory will echo Luke Skywalker's own past. Some speculate that he is an 'inverse' version of Luke and his well-established mythos. He is thought to be a villain who comes out of nowhere, with no preexisting history that the heroes know of, yet he still manages to cause tremendous damage to the Rebellion, now known as the Resistance, in much the same way Luke helped destroy the first Death Star. J.J. Abrams goes on to tease the character and his dark past. "As you see in the best of storytelling, and no doubt the best of Star Wars, these are tales in which an every person has to step up. And I think that what makes Ren so unique is that he isn't as fully formed as when we meet a character such as Darth Vader,. And I think that there are two sides to the Force. Both sides, arguably, would see themselves as the hero of their story, and I think that applies here." Lawrence Kasdan, who has a rich history with the Star Wars franchise, having written the screenplays for Star Wars: Episode V - The Empire Strikes Back, Star Wars Anthology: Han Solo Movie and this winter's Star Wars: The Force Awakens, calls Kylo Ren one of the most complex characters ever crafted for the franchise. He explains. "I've written four Star Wars movies now, and there's never been a character quite like the one that Adam plays. I think you're going to see something that's brand new to the saga. He's full of emotion. No matter how we express ourselves in the world, whether we hide it and act very calm or whether we're very out there and demonstrative, everybody's roiling with emotion. And you want your characters to be that way, too. Then they have to deal with their emotions as best they can, with what they are." What do you think? Will Kylo Ren become one of the great screen villains in the tradition of Darth Vader? Will the Knights of Ren become as iconic as the Sith Lords? Let us know your thoughts, and check out these two new photos of the villain that debuted in Entertainment Weekly, where you can read and learn more about the galaxy's deadliest Knight.